IEP’s (individualized education plans) are an essential part of an autistic students education plan. IEP’s are used in schools to convey the unique needs of the student to the teachers and support staff. These plans are required under Individuals with Disabilities Education Improvement Act of 2004 (IDEA 2004) as well as other education laws. Yet one complaint I hear frequently in Facebook groups from parents is that schools do not follow IEP’s, or that teachers are ignoring their students IEP’s. I have been teaching for 10 years in middle & high schools, and I thought I’d give my feedback from the teachers prospective on the difficulties with IEP’s. I’ll look at some of the common complaints I’ve seen and try to address them from a teachers prospective. Teachers do care about their students, and we do care for the unique needs of our students. If teachers could have the support needed to accommodate all IEP’s, we would use every support on hand. I’ve had students on various IEP’s, and I have worked to the best of my abilities to ensure their needs are meet. However the reality is teachers often have to triage what limited time and resources they actually have to meet IEP’s. With a class load of 60 – 100 mainstream students, teachers often loose sight of the handful of students on an IEP. Teachers care about IEP’s, but often times do not have the support or resources needed to fully implement them. This is both true and false for teachers. IEP’s are important legal documents that are given to teachers during teacher work days before the start of the school year. IEP’s are frequently given to teachers along with a stack of other documents that we have to read. Teachers then read them while we do required video trainings and set up our class. The formal IEP’s are then put in a folder in our desk and rarely read again. It is not until there is an IEP annual review meeting that teachers may remember to get it out to reread. When it comes to IEP’s teachers do try to remember what is needed in their lesson planing. But with IEP’s there is the IEP on paper, and the IEP that teachers can actually accommodate. Accommodations on a IEP can be extensive, but teachers have to manage a whole class in addition to individual accommodations. Some accommodations like extra time for test, or typing work, can be easily meet. I’ve had no issues giving students a pass to the library for extra time, or having them type their work on a laptop. Others accommodations are more difficult. I’ve had students with severe emotional issues or violent behavior issues. For these students I received no teacher training, and there were no accommodations in the IEP that I could apply to the class. The best I could do was send them to the councilor if they were having a bad day. For the student with violent behavior issues, I had to hope that they would regulate themselves enough to run out of the class if they were having an outburst; if not I’d have to call the admin or SRO (school resource officer) to remove the violent student from class. Teachers often hastily read IEP’s, and apply what they can in class. Teachers do want what is best for every student. Some accommodations are easy to apply to the classroom. We can make sure deaf students can sit in front of the class to read the teachers lips and give them a copy of teachers notes. Teachers can accommodate reading difficulties with books on tape or text to speech tools. Other IEP’s require accommodations outside of our scope of training. How is a reading teacher suppose to provide PT (physical therapy) activities? How is a science teacher suppose to present parts of an atom to a blind student? 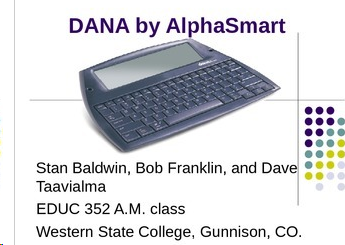 IEP presentation on a Alphasmart to accommodate handwriting issues. Screen capture by author. I’ve had a few IEP’s that list accommodations outside of what I was qualified or licensed to do. For violent behaviors, I was not trained in deescalation methods or restraint methods if a student became violent. If this student became violent in class, I’d be legally liable if any other students were injured, and I’d face criminal charges if I restrained the student. There are times when teachers don’t know how to accommodate students. This can be due to a lack of training, lack of resources, lack of administrative support, or a combination of all the above. There have been other times I did not know how to accommodate a student due to a lack of family support. In this case the family had a whole host of issues, and they would not communicate what the students needs were. No, teachers do not have the needed resources. The schools I have taught in usually have the following support staff. 1 part time nurse, 2-4 councilors, and 1 special education (SpEd) coordinator, and 3-5 para educators (paras) . The nurse is in charge of students meds during lunch, and may be on hand for other health issues during the day. I’ve had students with epilepsy in class, and I had to be trained on how to react if they had a seizure without the nurse. That sparse staffing equals 1 SpEd teacher with a student load of 50-100 students, and 2-4 paras assigned to small groups of students. That leaves teachers with 10 – 20 students a day with as many IEP’s in addition to their normal class load. Accommodations can be listed in the IEP, but that does not mean the teacher has been trained in how to use them. Nor have we had the training to act as tech support when a visual reader breaks down for the blind student. I’ve never received training on how to accommodate deaf students, nor have I received training on what to do when a student with a severe health issue is gone for weeks at a time. In the same way I’ve received little training in how to have autistic students in the classroom. For that I’ve had to rely on my personal experience. But if you know one person with Autism, you know on person with Autism. My experience may not resonate with different Autistic students. Teachers generally do want to work with family’s to meet the students IEP’s. Encourage students to be their own self advocate. When possible, have the student work with the teacher for ways to accommodate their needs in class. Have a cheat sheet ready for the teacher so they can quickly meet their students IEP needs. Understand what your child’s needs are, and what the school can realistically do to accommodate your student. 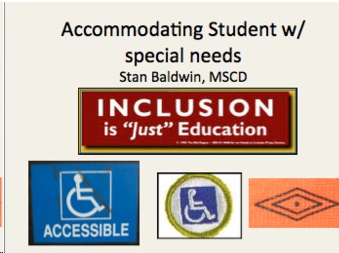 Not all schools can provide the full range of accommodations required on an IEP. Provide training or resources for the teachers. If there is a way for teachers to get professional development (PD) credit for it, teachers will attend. Make the accommodation something positive for the teacher. If the entire class can type their work, then the teacher can use googledocs to quickly grade the assignment. If the whole class has stress bands on their chairs, then they can all fidget quietly while they work. Why aren’t all students who want to use laptops allowed to use laptops? I’m not sure I’d be diagnosed with non-verbal learning disabilities, but I know this: I’d rather submit all my written work after producing it on a laptop because my writing is not that legible and I’m a perfectionist when I write so I love a laptop. In Ontario, calculators can be used by all students not just those diagnosed with a learning disability of some sort. There’s a difference among deaf, deafened, and hard of hearing folks. I’m hard of hearing so I may find the classroom difficult, but find one on one easy. I still need accommodations in the classroom. In the end, we have to say, “Are you the teacher or the principal a part of the solution or a part of the problem?” You should be part of the solution. If you have to seek out training on your own time or your own dime, do so! But get active with your union so other teachers get re-embursed for the money they lay out for addtiional training and education. I had to learn as a parent and I expect my children’s teachers to learn how they can accommodate my children. I have noticed that doctors seem to be more eager generally to learn than teachers are. Why is that? While many schools are going to 1 on 1 tech integration (iPads or chomebooks), other schools have yet to get funding and IT staff to run a 1 on 1 system. Teachers spend Hundreds of dollars out of pocket for school supplies already. Attending trainings and paying out of pocket is cost prohibitive for many teachers. I’ve seen trainings that run $400-600 for PD credit. That is difficult for teachers to pay. This is training that the school is suppose to provide to us as part of the IEP, yet they don’t have the budget to provide the training. If the school can’t pay for training, how can teachers be expected to pay? Children need to be “taught” to self advocate, and then can be encouraged to use their skills. How often is self advocacy taught to special education students? Teachers or case managers can make a cheat sheet for accommodations. Have a master list of all accommodations, than check off those listed on the IEP. If a school is unable to provide the accommodations required on an IEP, then they must send the child to a setting where they are available. That is the law. It is not the parents responsibility to provide training and professional development, nor do we need to design accommodations so they are positive for the teacher. There is certainly nothing wrong with having ALL students type or use fidget bands. However, accommodations are specific to the INDIVIDUAL student to provide for a specific need to access the curriculum. Self advocacy is almost never taught in SpEd. I learned to self advocate in college with a group of peers and parents. I like a master list of accommodations. Most IEP’s are written with a team of teachers that may not be in the school the next year, and may be optimistic from the start in terms of services that the district promises to serve. Schools may not have the resources available in terms of specialist. I’ve seen districts with one rotating specialist for visually impaired students that has to travel to every school in the district. That means that one specialist for 10-40 blind students, who can visit one day every few weeks. If parents have resources that can help teachers, I encourage them to contribute.